Entering Ivan Salaverry’s gym is like entering into a claimed territory, almost like arriving at gates where an intention is required to pass. If common thought argues that human beings are conditioned to seek pleasure and avoid pain, then Salaverry’s gym posits that pleasure is sought through pain, not around it. This is not to suggest that the people here are masochistic (although at the same time, all fighters are to a certain degree), just that if the intention for being there is to fight, then you’d better be prepared to work. As a fight journalist, I’m treated with much more leniency, and greeted warmly upon my arrival. I’m met at the door by Emmanuel Russell Jr., a wiry bantamweight who dons glasses and speaks in a gentlemanly conduct. He’s also one of the gym’s professional fighters and key employees. I knew Russell vaguely from a courtesy call made earlier in the day to prepare for my visit, a call that was preceded by a scheduling email, and an email that was preceded by a call from Salaverry himself. Of all the fight gyms I’ve ever visited, this one has been by far the most professional and responsive, especially since my first communication was made through one of those online media inquiries that you think nobody ever answers. 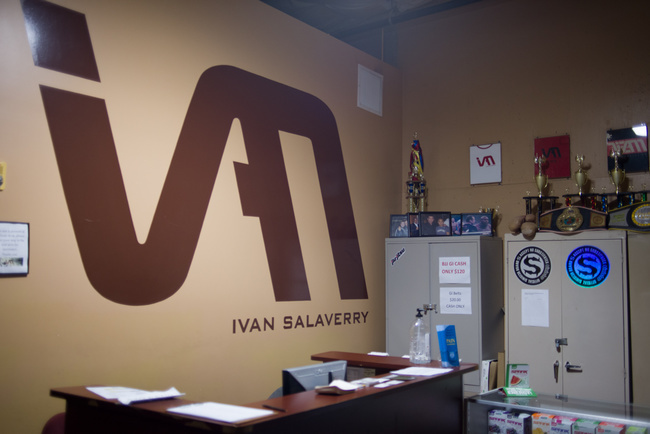 Entrance and reception area of Ivan Salaverry MMA in Seattle. Around the corner, the man himself appears. Salaverry shoots over a big grin and gives me a light embrace. “Finally! In the flesh!” he says to me smiling. We exchange a few pleasantries and the first thing you notice is the overall tone of his voice. He speaks with a polite business-like demeanor, light-hearted and humorous for the most part, but also with a slight edge that is reflective of someone who has overcome adversity. Basically, he isn’t someone you’d want to cross. Salaverry is a fighter’s fighter. An imposing presence with a stocky build and a thick pair of cauliflowered ears, souvenirs from countless hours spent training and fighting on the mats. For MMA fans, Salaverry is a household name, but even if you knew nothing about the sport and met him randomly on the street, it would still be clear that he’s had a long history with competitive fighting. 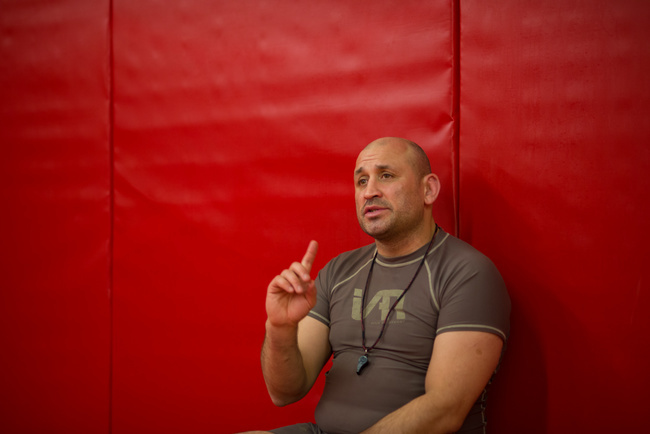 With a lifetime of wrestling and a couple years of jiu jitsu under his belt, Salaverry joined the legendary AMC Kickboxing and Pankration training center run by Matt Hume shortly after seeing the televised MMA match. There he was in the company of the likes of Josh Barnett, Maurice Smith and Dennis Hallman, and holds a long-list of the who’s who of the sport as friends and training partners. From there he went onto compile a 14-9 record and a signature move that is still referred to today in UFC broadcasts. With injuries accumulating towards the end of his career, Salaverry opened his gym (Ivan Salaverry MMA) in 2007 as a means to transition comfortably out of the sport. Amateur fighters Yelenda Badick and Joanna Levy practicing ground techniques during a “Ground and Pound” class. The climate of the gym is certainly a competitive one. There is evidence of it everywhere. Pedialyte and petroleum jelly sit randomly around the gym. Abolene and duct tape are in ample supply. In the entrance hallway hangs a dry-erase whiteboard listing upcoming events and the names of those billed to fight. A particular intensity is required to fuel a fight gym of this caliber and it shows in how its members describe the place. 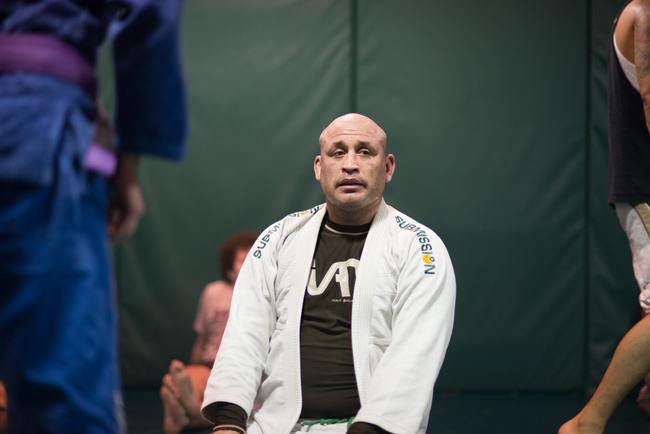 Ivan Salaverry leading a BJJ open mat session at his gym in Seattle, WA. Salaverry is currently a MABJJ Brown Belt. Salaverry taking part in the BJJ open mat sparring. He often joins in the sessions to teach techniques firsthand. There’s no real way to sugar coat it. Sessions here can be brutal and the bar of expectation for competitive fighters is held higher than most. “Iron sharpens iron” is the team’s motto, and the approach to training stays faithful to that ethos, earning a reputation of being one of the toughest fight factories in the Northwest. If one is looking to become a serious fighter, however, this is the place to be. After all, it is adversity that separates the pack. Salaverry observing the action during the gym’s MMA training. The gym has had to balance its approach between functioning as a training facility for fighters and providing an “MMA experience” to prevent turnover from its non-competing members. Over the years, it has now also become an inviting environment to those who have no desire to compete since like most fight clubs, Salaverry’s gym composes of two groups. The first is what he calls “lifestyle martial artists”, those who hold professions outside of the gym to pay the dues and keep the gym fiscally afloat. The other is the fighters, the everyday members who have the full intention of competition and train in that fashion, the ones that Salaverry refers to as “my guys”. He currently holds a steady stable of about 15-20 competitive fighters. 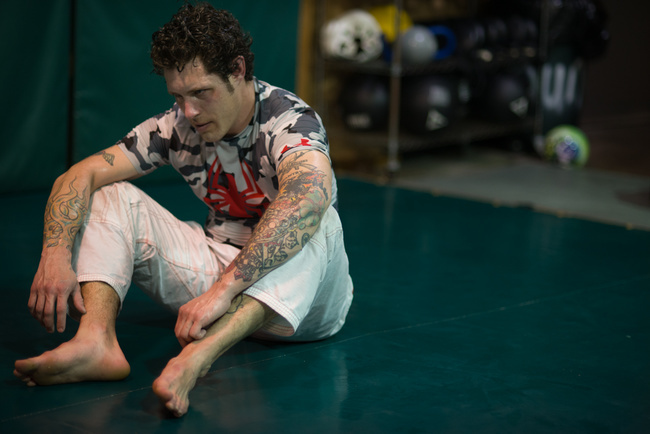 Former Army Ranger and 4th degree BJJ blue belt Matt Wilson resting after a roll. Wilson says the level of intensity at Salaverry’s was a key element in his adjustment after returning from tours in Iraq and Afghanistan. Professional MMA fighter Mike “The Boss” Ross. About five rounds into the sparring session, one of the fighters doubles over from a knee to the abdomen, grimacing in pain. Nobody overreacts and there certainly aren’t any looks of apology around the place. There is, however, plenty of measured concern. It’s hard for me to pinpoint the exact ambiance of the gym. On the one hand, it’s one of the more brutal training grounds that I’ve ever encountered, but on the other, that sense of genuine care is still present. Mazany holds a perfect 3-0 professional record and appeared on the first episode of the 18th season of The Ultimate Fighter, facing off in an exhibition match against the show’s eventual winner Julianna Peña. Though Mazany lost the two-round bout, she lost via unanimous decision, making her the fighter to have lasted longest against Peña throughout the show. She’s now on the hunt to regain an opportunity in the UFC spotlight. 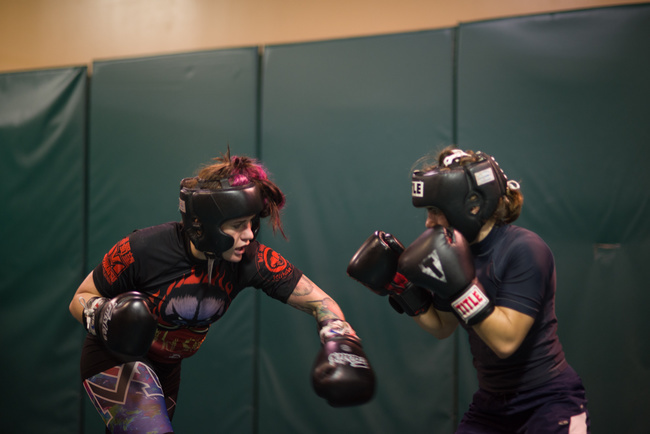 Professional MMA fighter Gina Mazany sparring against her teammate Joanna Levy. Members gather in the middle of the room to close out and celebrate the end of a training session. Speaking to Mazany and watching her fight are two completely different experiences. She speaks in a light, jovial manner, perhaps even what one might consider perky, but when she fights she is ferocious and focused. She pushes a taller male fighter around the room, unloading body shots and shin kicks, egging him on to hit her. “Uppercut! Uppercut! Uppercut! Hit me!” she yells. Her reluctant partner, for whatever reason, shakes his head. “You can hit her,” Salaverry calmly chimes in from the back. In total, the fighters go through nine rounds of full-contact, full-intensity sparring, only taking water every three round stanza. The session winds down with a series of sit-ups and back-flys, topped off with 100 repetitions of a medicine ball being mashed into their stomachs. The group huddles together and yells out the gym’s name to close out the night. Plenty of hugs and pats on the back are passed around. 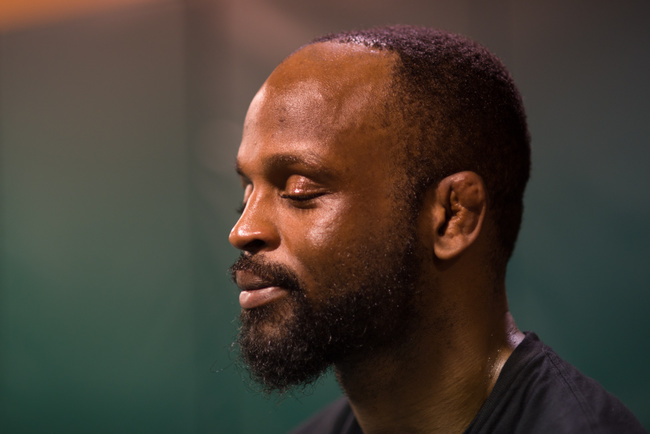 The fighter responsible for doubling over his teammate steps over and offers some advice. The way to describe Salaverry’s gym is through oxymoron. Quiet intensity. Bridled chaos. Even the blunt Mike Ross had an underlying sense of calmness to his overall demeanor. I would say that their approach to training flirts with the boundaries of brutality, but has also built a solid structure of order to successfully contain it. In essence, it is run as a direct reflection of what Salaverry has gained from his own experience and looks to pass onto the next generation of fighters. To visit Ivan Salaverry MMA, click here.